Seasons of Insanity is a short story collection featuring twelve tales themed around the four seasons; Spring, Summer, Autumn and Winter. 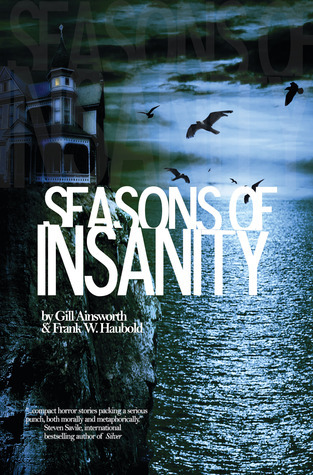 It is co-authored by award winning writers Gill Ainsworth and Frank W.Haubold. Unlike most horror I am used to reading, this leans more towards psychological horror rather than supernatural so was quite a different read for me. It focuses more on humans coming apart crashing into insanity to the darkest depths and never coming out again. It's not monsters and dark spirits we should be afraid of but ourselves and what our own darkness is capable of. I liked that each author had their own distinct voice and they work well in this anthology which keeps you in its grip right to the end. There's something in here for everyone. Stand out tale for me was, Fighting the Flab by Gill Ainsworth. This really resonated with me and was incredibly shocking. I also really enjoyed The End of the Line about an older woman coming to terms with her grief. The Town on the River was a really creepy tale about being drawn back to your home town after so many years, I loved the tension building up throughout.